Atturo has partnered with knife designer Quartermaster Knives in the design of our Trail Blade series of tires. Here you can find the knives which were the inspiration for the tires. Outfit with custom finishes unique to Atturo, these blades are both functional and distinguished from the already rare Quartermaster cutlery. 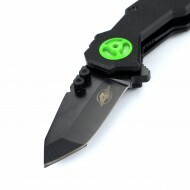 The QTR2 features the Karambit, talon shaped, blade which is also featured on the Trail Blade M/T tire. Angular and industrial in appearance. An enlarged finger hole accommodates the most swolle..
QTR-3XT knife and hard case with custom cut foam. This combination pack features the QTR-3XT knife from Quartermaster along with an Under Water Kinetics Ultra Box 406. The knife is cradled..
FEBRUARY SPECIAL - The BOSS knife is the companion blade to the brand new Trail Blade BOSS. This is a magnum size blade, to match the large format tire sizes. This knife is the equiva..
QTR-3XT -- **LIMITED EDITION OF 300 PCS ** The second integration of a knife blade into our tires used the QTR3 as the foundation of the Trail Blade X/T. In the case of this urban al..